Two female suicide bombers, on Wednesday 01/13/2016, have attacked a mosque in a town near Cameroon’s border with Nigeria, killing at least 10 people and wounding about a dozen others, the governor of the region said. The attack during morning prayers in the town of Kolofata is believed to have been carried out by members of the Islamist group Boko Haram who crossed the border into Cameroon a few days ago, said Midjiyawa Bakari. 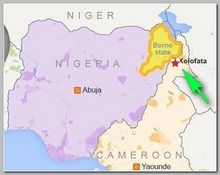 Kolofata in Cameroon’s far north has been attacked repeatedly by Boko Haram. Also on Wednesday 15 people were killed in Pakistan, Quetta’s folio center by a suicide bomber, two other suicide bombers attacked th Pakistani and Indian Consulates in Jalalabad, Eastern Afghanistan and the wars in Yemen, Libya, Syria & Iraq are raging on fiercely. 08/2015 – WHERE IS BOKO HARAM’S LEADER ?